The magnitude of it, you can't even describe it. Last week, while attempting to decontaminate sludge from a pond at a gold mine in Colorado, the Environmental Protection Agency (EPA) accidentally breached a dam and dumped millions of gallons of waste water into the nearby Animas River. 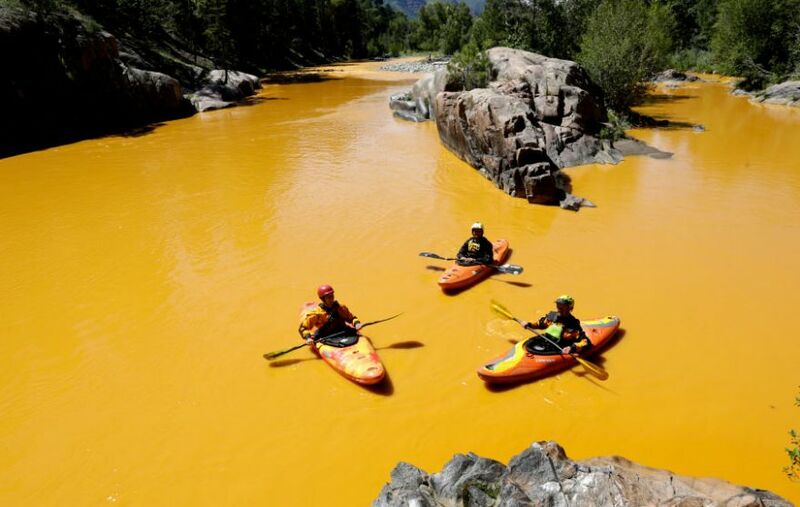 The spill turned an 80 mile stretch of waterways bright orange affecting three states. The EPA, one of the most active (and corrupt) government agencies in the Obama administration, initially downplayed the amount of waste that had spilled and the impact it would have on the environment. However, it turns out the spill is significantly worse than originally predicted. Three million gallons has already spilled into the river, three times more than initial reports described, threatening not only the environment, but the drinking water supply for thousands of people as well. The EPA has since tested the water and found that as of Sunday, arsenic levels are 300 times more than normal and lead levels are 3,500 times more than normal. The contaminated water is not contained and is expected to reach the frequently visited Lake Powell before the end of the week. The Navajo Nation Indian Reservation, the largest in the country, plans to sue the government agency and has been severely affected by the spill which the EPA admits could be a serious problem for a long time. The media, which routinely hammers oil and coal companies for toxic spills much smaller than this one, have been relatively silent. In fact, some left wing outlets have gone so far as to defend the EPA and blame the residents of the area. MSNBC interviewed an “expert” named Dokoupil who after defending the EPA’s good intentions leading to a bad outcome, he essentially blamed the residents in the area who have been pushing for more mining (aka more jobs) and not giving the EPA the funds it needs to clean up the waste. The local media has been compliant in the cover up as well and in one story from the Durango Herald, the reader has to navigate through 17 paragraphs in order to find out who was responsible for the spill. The New York Times buried the story as well. Five years later, the media is still actively reporting on the BP oil spill in the Gulf of Mexico. Granted that case was far more severe in terms of gallons of contaminants but it begs the question why this story which has yet to be resolved and could pose direct serious health risks to the public that far exceed the oil spill in the gulf, has been so severely under reported. The LEFT-WING LIBERALS are all Anti-United States of America Everything!! Obama’s EPA NAZIS are all LAWLESS and very CORRUPT!! BHO HATES ISRAEL-YISRAEL and our JUDEO-CHRISTIAN NATION UNITED STATES of AMERICA!! Ronald Reagan once said: If we forget that we are “ONE NATION UNDER GOD” then we would be one nation gone under!! The Animas River runs through several cities and towns in Colorado, ultimately emptying into a lake in a national park. The EPA hasn t yet addressed the possible impacts on the lake or local residents but officials have admitted that the impact of the toxic waste in the river could last for years.